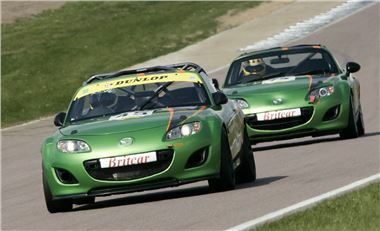 Mazda UK has entered three MX-5s into the Britcar 24hr race at Silverstone on 1 October. The three Mazdas will be taking on rivals Seat, BMW, Lotus and Ginetta on the 3.666 mile Silverstone GP circuit. Two of the cars are production race cars based on the Mazda MX-5 2.0i Soft-top Sport Tech alongside the world's fastest and lightest Mazda MX-5, the MX-5 GT car. This is the fourth time that Mazda UK has entered the Britcar 24hr race, previously with the rotary‑engined Mazda RX-8 in 2005 and 2006 and two Mazda MX-5 production cars in 2010. Currently, the 850kg Mazda MX-5 GT ranks fifth overall in the championship and third in class, while the Mazda MX-5 production race car, which is essentially a standard MX-5 with safety modifications required by the Motor Sport Association, is fourth in class and eighth overall. The entry is in keeping with Mazda's challenger spirit - competing against much faster race cars but relying on the attributes of the MX-5 to bring victory within its grasp. Over the 24 hour race each car will be driven by a team of four drivers. The line-up for the MX-5 GT race car see regular drivers Mark Ticehurst from Hassocks, West Sussex and motoringjournalist and racing driver, Owen Mildenhall from Dartford, Kent joined by Le Mans veteran and ex F1 driver Mike Wilds. The first of the two production MX-5 race cars will be driven by a team of four journalists: freelance journalists Andrew Frankel and Jethro Bovingdon, Ben Anderson from Autosport andMatthew Prior from Autocar. Driving the second production MX-5 race car will be a team raising the profile of British Armed Forces Charities in motorsport. These include The Not Forgotten Association - one of the 2011 chosen charities for the RAF Typhoon Display Team, of which Mazda is the 2011 vehicle sponsor, Help for Heroes, the 'Soldiers' Charity' - the Army Benevolent Fund, Forces Children's Trust and Scotty's Little Soldiers. "In just our first year of racing the MX-5 GT race car we are currently fifth overall in the championship which has included two podiums and we are third in class. The Britcar 24hr race will be a true test of our award winning roadster's ability," comments Graeme Fudge, PR Director, Mazda UK. "It is an honour to support these British Armed Forces charities with an MX-5 race car and with the team's endurance spirit combined with the handling, reliability and durability of the car, we are hopeful of a good result." See www.raf.mod.uk/typhoondisplay/ for the latest news from the RAF Typhoon Display Team.